Midway Games announced today that it has named Harvey Smith the creative director for Midway Studios-Austin. An industry veteran with more than 10 years of experience in game design and development, Smith will report directly to Denise Fulton, head of Midway Studios-Austin. "Harvey brings a wealth of creative and technical expertise to the studio and we are confident that his input at all levels of development will further enhance the quality of our products," said Fulton. Mr. Smith joins Midway from Ion Storm Austin, where he served as project director on Deus Ex: Invisible War and lead designer on the award-winning, Deus Ex. Prior to joining Ion Storm, he worked at Multitude as the lead designer on Fire Storm, an innovative tactical squad game that was one of the earliest video games to feature voice-communications between players. Smith's additional gaming credits include CyberMage, System Shock, Thief 3, Ultima VIII and Super Wing Commander 3DO. Earlier in his career, Mr. Smith held a variety of design and leadership-related roles emphasizing communications, team building and game design. His creative interests are linked to player expression and game ecology, and he has spoken on both these subjects, among others, at various seminars and conferences around the world. Well, would yah look at that? It looks like Infogrames slipped in yet another Test Drive Xbox game right under our noses. 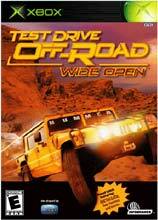 The new game, Test Drive Off-Road—Wide Open, is being developed by Angel..